We’re always looking for new ways to give you the most intuitive user experience and control as possible. We’re pleased to announce that one of the most requested features has finally arrived; the ability to see which episodes you’ve already listened to and how many minutes you have left to hear on specific episodes. Our interface updates make it clear to see exactly where you were in a podcast series and episode. If you’re someone who starts listening to an episode and five minutes in realises you’ve already listened to it, this won’t be happening anymore! From now on a handy yellow tick will sit alongside an episode title when you’ve already listened to it and if you click on the episode you will be able to see the exact date you tuned in. We’ve added in a line which tells you how many minutes you have left to listen to and instead of being completely yellow, a percentage of the circle will be filled which is in-line with how much you have left to listen to. The ability to switch episode order, playback speed and even set a sleep timer to automatically switch your podcast off if you’re known for drifting off ten minutes in to a show! Spreaker Podcast Radio allows you to switch the episode order of any podcast from oldest to newest so that you can more accurately follow the narrative thread. You can listen to true crime podcast and audiobooks as they were meant to be experienced, from episode one, even if they’re already six episodes into the program. Reversing the episode order can be useful when listening to regular talk shows, too–follow your favorite host’s creative trajectory (and finally get all those inside jokes). You can reverse the episode order of any podcast from its Info section. In all these cases, manipulating the playback speed settings is the best option you’ve got. You can set the playback speed by going to the episode view, and under the seek bar tap on OPTIONS (that’s on iOS, anyway, on Android you can tap on the settings icon at the top right). Tap and drag the yellow dot to get to your preferred “podfaster” speed. Lastly, there’s the sleep timer, a great feature So, if you already have a feeling you’ll fall asleep in about five minutes, tap on “+5min.” To set it to fifteen minutes, you can tap on “+15min” or tap on “+5min” three times. It's an in-built, simple, podcast player, pre-installed on every Google Play-enabled Android phones. That's essentially all of them. IT IS NOTHING TO DO WITH PODCASTS ON GOOGLE PLAY MUSIC. Android is the most popular mobile phone operating system in the world - it's used by over 80% of smartphone users. The Google Podcasts player is already installed on virtually every one. Is Google Podcasts available in my country? Yes. It is available worldwide. Where do my listeners download the app? Your listeners don't actually need to. Just add a direct link on your website to your podcast on Google Podcasts, and they'll be able to listen immediately, without having to download an app. You can download the Google Podcasts app if you like. It's a tiny, 100k, icon which looks like any other app, and points to the app already installed on your phone. What is my podcast's direct link for Google Podcasts? Google has a tool to help you. Visit this page and type in your podcast's RSS feed. If it's listed, you'll get a link which, on an Android phone, takes you directly to your podcast's latest episodes. Here's ours. Your listener does not have to have the app installed - it will still play. How else can my listeners listen? They can just search for you in Google, and, on an Android phone, your podcast will appear in the search results, complete with play buttons that take you into the Google Podcasts app. How do I get a nice "Listen on Google Podcasts" badge or logo? You can download these straight from Google, here. They're in PNG or SVG format. They should be the same size as the Apple Podcasts button you probably already have. Should I link to Google Podcasts instead of Google Play? Yes, you absolutely should. Google Play has never contained podcasts outside of the US and Canada: and requires Google Play to be installed on the Android phone. Google Podcasts works across the world, and does not require any app to be installed. How do I know how many listens am I getting on Google Podcasts? Your podcast host can help you here: the regex of the user-agent is \b(GoogleChirp|GSA)\/ - GoogleChirp on Google Assistant, GSA on Android devices. (We list more podcast app user-agents). How do I know Google has listed my podcast? Use the direct link generator tool. How do I submit my podcast to Google Podcasts? Chances are you're already there - use the direct link generator tool. If you're not listed, Google have a set of guidelines to help you. They're technical, so you'll need to involve your web designer. We've written a simpler guide here. Does Google Podcasts do shownotes? Yes. But it uses the field, rather than ; and it irritatingly strips out all HTML formatting and links. What's the difference between Google Podcasts and having my podcast on Google Play Music? It's entirely different. Google Play Music isn't available anywhere outside the US and Canada, and requires a software download. Google has already said it's replacing Google Play Music with YouTube Music in time, so it's likely going to disappear. Does Google Podcasts cache the audio files? What else do I get as a podcaster? The front of the Google Podcasts app shows suggested podcasts based on a listener's previously-enjoyed episodes. Some of them show "Other podcasts by..." and link to every other podcast you've produced. There are trending podcasts based on listening habits and categories. It's designed to make listeners discover more new podcasts. Including yours. I'm a podcaster. What should I do now? Add your Google Podcasts direct link now on your website. Make sure it's the same size and prominence as your Apple Podcasts link. Nobody likes feeling second-best. Always promote your website. Never only link potential listeners to Apple Podcasts: for at least 50% of them, it's a useless link that doesn't go anywhere. How do you go about taking episodes off of IHeartRadio ? I only ask because i accidentally published a live broadcast before i could edit it, and now i have an edited and unedited on IHeart. Also, is there anyway to update the show artwork on IHeart? Hey Rob. 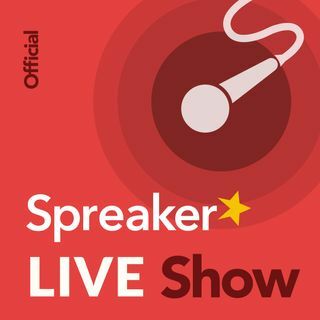 Question: You can disable comments on your show page in Spreaker? I was trying to leave one for Pat Flynn and the Smart Passive Income show but it won't let me. But everytime I hit enter I see the comment button I see the tally go up. It now stands at 3. I am not typical of most women and I love your dramatic presentation, Alex! Alex Exum orders an expresso NOT an espresso. Alex's voice is like a roller coaster ride at Six Flags, in a good way. The Google Podcasts app leaves a lot to be desired. As an avid consumer of podcasts (in addition to a podcast producer), if I can't create a playlist then the app has no appeal to me whatsoever. The app is virtually featureless. I hope this is just the beginning for Google and that they don't stop here. We appreciate you joining us for the Live show today! Thanks Doug for joining us. Alex is going. He just needs a ticket.